Ladies of Cannabis, Women of Weed, Those New to This Healing Plant, Come Learn About CBD. 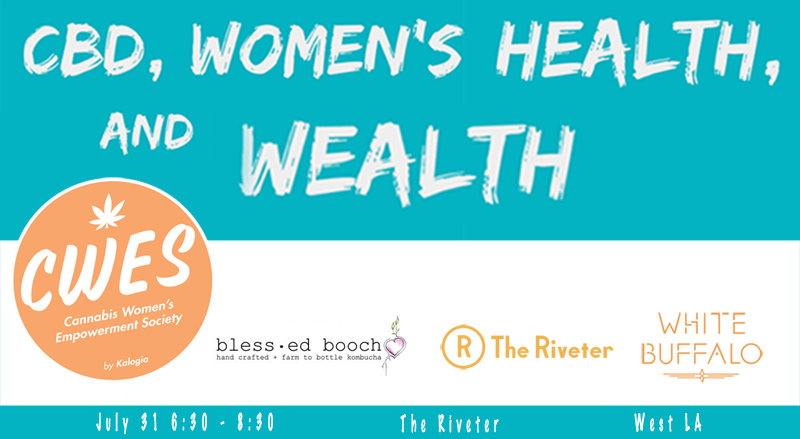 Join us at the new and amazing female forward co-working space, The RIVETER in West Los Angeles, for a learning and networking event on the subject of CBD a.k.a cannabidiol. You will hear from industry entrepreneurs, Simone Cimiluca-Radzins of Kalogia and Courtney Freeman of White Buffalo as they discuss the legalities of CBD and tips you should know. We’ll have an open discussion around CBD and its benefits where you can share your story and your favorite products. Blessed Booch will be serving up kombucha! Come try their delicious flavors and take advantage of our exclusive $1 off discount on 16 oz bottles! This is a non-consumption event. Lights snacks and beverages will be provided. Find out more about Cannabis Women’s Empowerment Society at www.CWESOnline.com. Discover the Kalogia Cannabis industry business directory at www.Kalogia.com. Explore White Buffalo Spirit lifestyle products at www.WhiteBuffaloSpirit.org. Are you a business owner? Interested in sponsoring or exhibiting at this event? Want to learn more about work space at The Riveter? Use the form below to get in touch and let us know about your business. We’ll contact you promptly to discuss how we can collaborate.